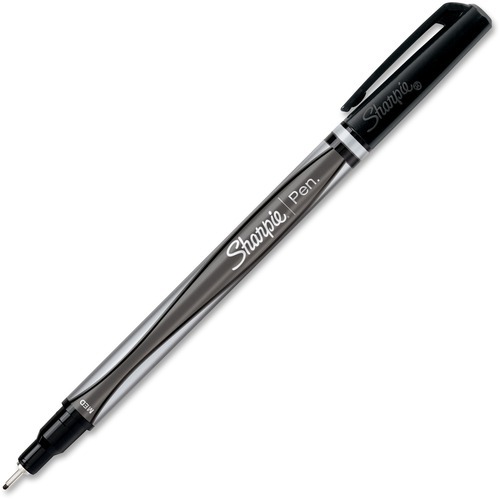 Sharpie Permanent Marker - Medium Marker Point Type - Black Ink - 1 Each - Welcome to TABS! Sharpie Pen is especially designed for your everyday writing needs. Use it for taking notes, journaling, writing letters, making cards and more. The bold permanent ink won't bleed through paper. Nonrefillable pen offers a plastic cap and durable fine point that delivers precise, consistent writing with minimal effort. Acid-free, nontoxic ink is water-resistant and smear-resistant when dry. Sharpie Pen is especially designed for your everyday writing needs. Use it for taking notes, journaling, writing letters, making cards and more. The bold permanent ink won't bleed through paper. Nonrefillable pen offers a plastic cap and durable fine point that delivers precise, consistent writing with minimal effort. Acid-free, nontoxic ink is water-resistant and smear-resistant when dry.